Whether you’re just getting started with snorkeling, or if you’re pretty much a pro, having your own snorkel gear is a great idea. 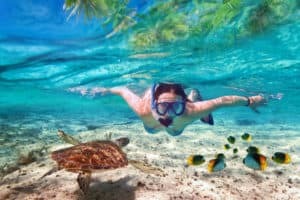 Especially if you frequently go on professional snorkeling tours, you will likely end up having to use old, worn out, and possibly even dangerous. Plus, having your own gear ensures you won’t contract anyone else’s germs. But how can you find the best snorkel gear on the market? You can start by reading this post! No matter your level, destination, or interest in snorkeling, we’ve put together this comprehensive list of how to find the best gear for you. Of course, this is the most important piece of gear you’ll buy! If your mask doesn’t fit you, you won’t just be uncomfortable – you’ll also really have trouble getting that perfect underwater view. Your snorkeling mask can really make or break your trip, so it’s crucial that you bring your own to avoid any unpleasant experiences. When it comes to choosing your mask, there are a few things you want to look for. We love the Cressi Ranger Adult Scuba Mask for this reason. In addition to being designed to be easy to clear off, it was also created to ensure that your mask stays as close to your face as possible, thanks to several anti-slip features. Still, that security won’t be uncomfortable, as the mask uses ultra-soft silicone material and comes with a wide strap you can easily adjust. We also love that you can reach the nose pocket with only one hand. This makes equalization underwater a lot easier. It’s one of the more affordable options, at under $50.00. Of course, when you’re choosing a snorkel mask, it’s not only function that matters. You want to ensure that the fit is snug, but also comfortable. To make sure you’ve chosen the right fit, try on your mask while standing up, and looking directly down at the floor. Take a deep breath in and out. If your mask doesn’t move while you’re breathing, then you have the right fit. However, if the sides of the mask itself (not the straps) start to move and create gaps, you need to keep looking. This mask is designed to actually mold to perfectly fit the shape of your face while ensuring no leaks get through to your mask. If you need to make adjustments to the strap, you can easily do so using the buckle. All you have to do is gently pull your straps to the perfect fit, and the buckle does the rest. Plus, this mask has a 2-year warranty! Obviously, this is a hugely important choice, because this is going to make sure you can safely breathe while keeping your head underwater! While it can be tempting to shop by price, you also need to keep in mind that low-quality sets make it easy for water to roll into the snorkel – which can be incredibly dangerous. You don’t have to spend a ton of money to get the best fit, but you do need to be willing to make a bit of an investment in your safety. When selecting your snorkel, we suggest looking for an option that’s either fully dry or semi-dry. A “Dry” option means that it’s designed to stop water from getting inside the snorkeling valve when you first get into the water. Basically, this is a tiny floating bob that moves up to shut the airway when you dive in. When you come back up, the bob moves down to let you breathe. If you’re into taking more shallow dives and prefer to stay close to the surface, then a dry option is the best fit for you. We love SEAC’s Dry 360-Degree snorkels. This brand has worked hard to ensure that, no matter how your gear is positioned as you move throughout the water, you won’t have water coming into your valve. However, if any water accidentally does end up in your valve, this option is designed with a purge system to quickly and safely flush the water out. It’s mouthpiece is made of silicone, which means it will be comfortable and will easily mold to the shape of your mouth. The hose itself is strong enough to withstand lots of pressure, but can adjust easily to the angles of your body and dives. We’re also into Cressi’s Supernova Dry Snorkels, which are specially designed with your comfort in mind. They’re made with a special mouthpiece created to reduce the amount of tension and pressure on your jaw. The mouthpiece even easily falls away when not in your mouth! When you go underwater, the special breathing valve is fully shut off, ensuring that no water gets in. If you’re into taking deep dives and want to stay down for longer (meaning that you need to really ration the amount of air in your tank) semi-dry snorkels are a great option for you. These snorkels allow for smaller amounts of water to get into the valve when you’re entirely underwater. Since these are mostly used by scuba divers, you may not need one if you’re planning only to snorkel. Still, since there are many affordable options on the market, you might consider picking one up just in case you decide to add a little scuba to your trip! Of course, it can work for snorkeling as well. We like the Ivation Semi-Dry Snorkel, which comes with a special splash guard. It also has an adjustable buckle that you can move around with one hand. Because you’ll be underwater for longer periods of time, this option also comes with a larger draining chamber. We also love that its valve is specially designed to lower the resistance you experience when you swim, thanks to its hydrodynamic tube. Another great option is the popular ScubaPro Escape Semi-Dry option. We love that this one has a larger tube, allowing you to take in more air with every breath. It’s also one of the easier-to-clean options on the market because the purge system (which expels the water) is as low as possible. Like some of the other offerings on our list, this one’s mouthpiece also is designed to mold to the specific contours of your mouth. This will help to reduce any discomfort. Whether or not you choose to travel and dive with fins will depend on a few things. First, your own swimming ability and comfort level. If you’re taking shallow dives and staying underwater for brief periods, you may not even need fins if you’re a strong swimmer!for longer, more intense dives, fins are a requirement. For longer, more intense dives, fins are a requirement. Also, shorter fins are better for the underwater ecosystems. You’re a lot less likely to accidentally collide with reefs and even fish when you’ve got on shorter shoes! We love the Cressi Palau Lightweight Short Fins for this reason. Like many of the masks, these fins are also adjustable and designed to reduce the slippage that can really ruin a trip. The foot strap is designed with your comfort in mind, and the extra-strong buckle ensures that everything will stay in place. Plus, they even come in a variety of colors, so you can stay stylish under the sea! We’re also fans of the U.S. Divers Trek Travel Short Fins, which are designed to be especially compact. The fin is a dual composite construction, so you’ll get an extra “kick” that will help to propel you forward even further. Like the Cressi fins, these are also designed to be comfortable and come with an adjustable strap. Whether you’re headed out on your first ever snorkeling trip, or if you’ve lost count of how many times you’ve been underwater, we hope you found this list helpful. Buying your own gear isn’t just a great safety measure, it also encourages you to stick with this hobby! Looking for more advice about how to get the most out of every snorkeling experience? Want more information about the top destinations? Need more expert input about the highest quality scuba and snorkeling gear? Check out our website to connect with other diving lovers and to learn more about how to make your next trip your best dive ever.